The enormous paved Plaza de la Constitucion, or Zocalo, is the second largest city square in the world. Dominated on one side by the magnificent colonial Presidential Palace, and on the other by the great Metropolitan Cathedral with its ornate interior, the square is Mexico City's centre of government and religion. 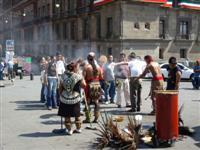 The square itself is always filled with activity, with vendors and buskers, informal traditional Aztec dance performances, family groups, workers on lunch break and passing tourists. Every evening the presidential guards, in a show of great ceremony, lower the national flag from the central flagpole. The square is constantly encircled by the city's ubiquitous green Volkswagen taxis, and is a good starting point for those wanting to explore the city.